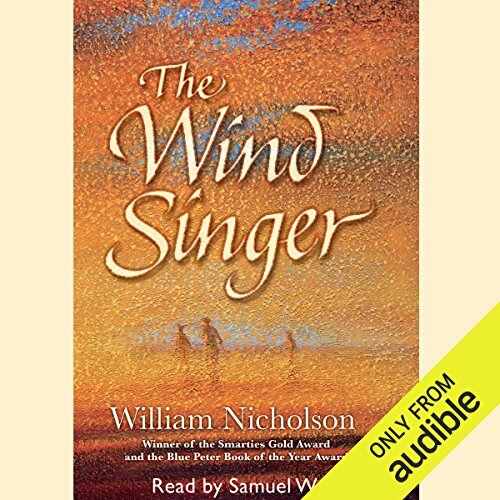 ©2001 William Nicholson (P)2014 Audible, Inc. The Wind Singer is an amazing children's book that doesn't have to be just for children. It is emotional and unique, not a rehashed story that's already been told. It is a fantasy story, though I think it falls more in the realm of dystopic fiction, without the harsh, futuristicness that is so often encountered in that genre. I recommend this book to anyone who has ever enjoyed YA lit at any point in their lives. Unfortunately there were significant portions of the story that were too Alice in Wonderland for me. About a quarter of the book. The rest of the book really was excellent, which is why I made it to the end of the story. The narration was excellent. I would definitely listen to Samuel West again . It is a meaningful story with an adventure of variety. I read it in my youth and enjoyed it again as an audiobook. A well-written fantasy/dystopia story for middle-grade readers. Samuel West is an excellent narrator. He interprets the story with wit and verve. All the characters, and there are many, are distinct and easy to recognize through his many subtle voice variations. Beautifully done. I must admit I purchased this trilogy simply because Samuel West is a superb reader and his choice of novels hasn't let me down yet. And here's another great story, this time written with young teens in mind but absorbing for adults too. The Audible description doesn't make it sound that interesting but it's a highly imaginative tale of a city/civilisation under attack and of the girl & boy twins (Kestrel and Bowman) who set out to save their city and people. It's an adventure story with a strong mystical undercurrent. What I liked most was that each twist in the tale was unpredictable, particularly when the twins got themselves into Perils-of-Pauline situations. Each of these books can be read as a stand-alone, but it's definitely worthwhile listening to them all in sequence (The Wind Singer; Slaves of The Mastery; Firesong) to find out what happens to all the different characters. Samuel West, as usual, does a brilliant job with his narration. I hadnt read these books and came across a recommendation. I simply adored them - buying Books 2 & 3 before I was half way through book 1 - and listened to them all one after the other. Samuel West is brilliant - he has a wonderful voice and gave the story a perfect delivery. If you could sum up The Wind Singer in three words, what would they be? Just as good as I remember with great delivery. not a good story for younger listeners. Samuel West's performance made the book immersive and difficult to put down - just brilliant. Thought-provoking. A great reading as well. Relevant, well written and imaginative. One of those books that will engage 'old' and young readers alike. I first read this book when it first came out as a teen, I fell in love with Bo and Kess even back then. All the characters are just so full of life and believable. It was a great read full of danger, chases, fights for freedom and a massive mystery as to who the Mora is and why Aramanth is the way it is. It is a series that I have read a few times. I found it again recently and instantly was transported back to the wonder of back then. It was a wonderful read that keeps you on the edge of your seat.